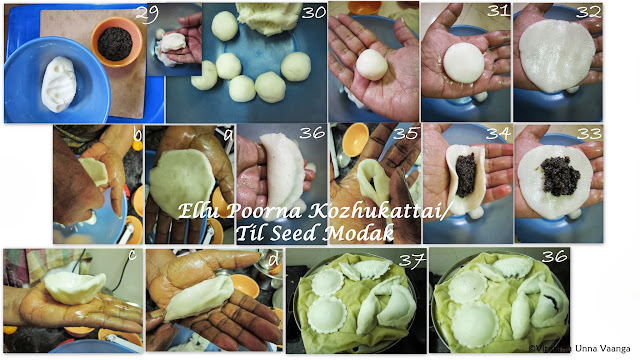 VIRUNTHU UNNA VAANGA: ELLU POORNA KOZHUKATTAI I TIL SEEDS MODAK I SESAME SWEET FILLING DUMPLING - SNC-12! 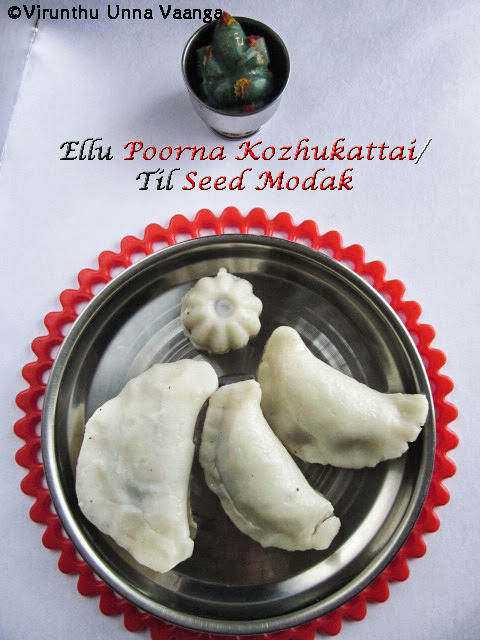 ELLU POORNA KOZHUKATTAI I TIL SEEDS MODAK I SESAME SWEET FILLING DUMPLING - SNC-12! 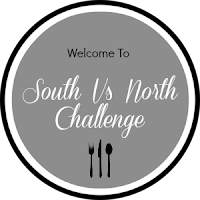 I am hosting this month on behalf of South Team, am really very proud and pleasure to host the challenge. Actually I was thinking from the beginning of SNC, that what am going to do... 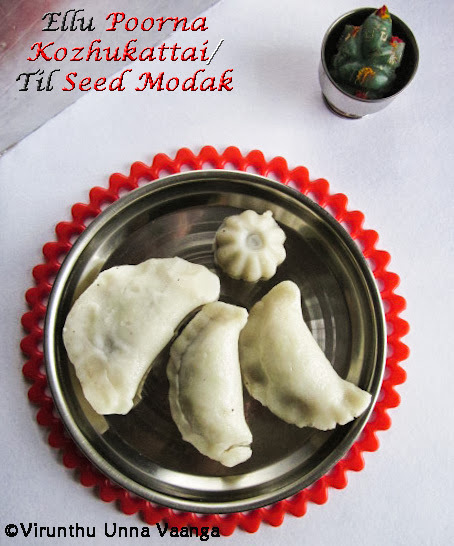 But luckily the festive month here, and very apt recipe for the challenge as well as its 12th month of celebration too... N also happy to celebrate Ganesh Chaturthi with our SNC family.As all you know that September 9th is Ganesh Chathurthi… So I prepared Ellu (Til seeds/Sesame) Kozhukattai (Modak/Dumplings), its like momos. 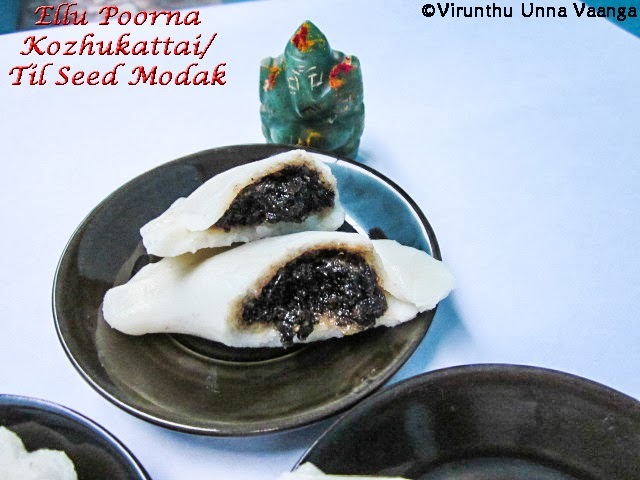 Kozhukattai is a authentic and popular Indian sweet steamed dumpling made from rice flour, grated coconut, jaggery as a main ingredient, and is similar to Modak made in other parts of India. Am great fan of the kozhukattai, I am sure our North team friends too will love this, is it friends?? 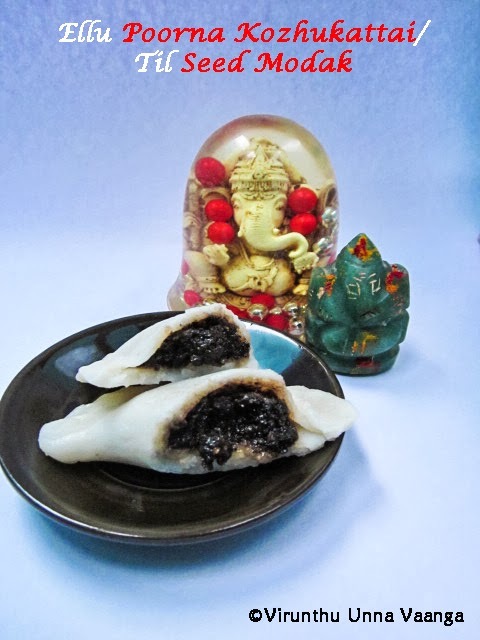 With the black sesame seeds with jaggery it goes awesome and moreover its very healthy. 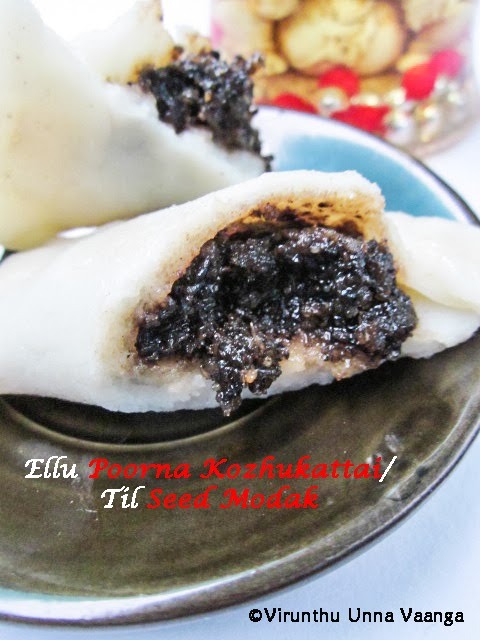 The taste of the ellu kozhukattai is unbeatable, the soft outer layer and inner sweet filling. 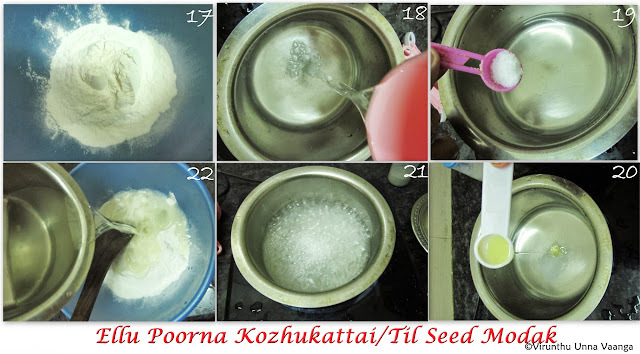 Usually, in old days even now some of them, preparing this recipe from soaked rice but its bit difficult process so I have given simple form of the recipe yet authentic and tasteful. Jaggery is a natural sweetener and its taste good compared to sugar, its effectively cleans the respiratory tracts, lungs, food pipe, stomach and intestines. It pulls out dust and unwanted particles from the body, while also giving relief from constipation, perhaps due to presence of fiber in it. Digestive agent - It activates the digestive enzymes and itself changes to acetic acid in the stomach, thereby speeding up digestion and making the process go very smooth, reducing strain on the intestines and digestive tract. Contains many minerals, mainly iron. 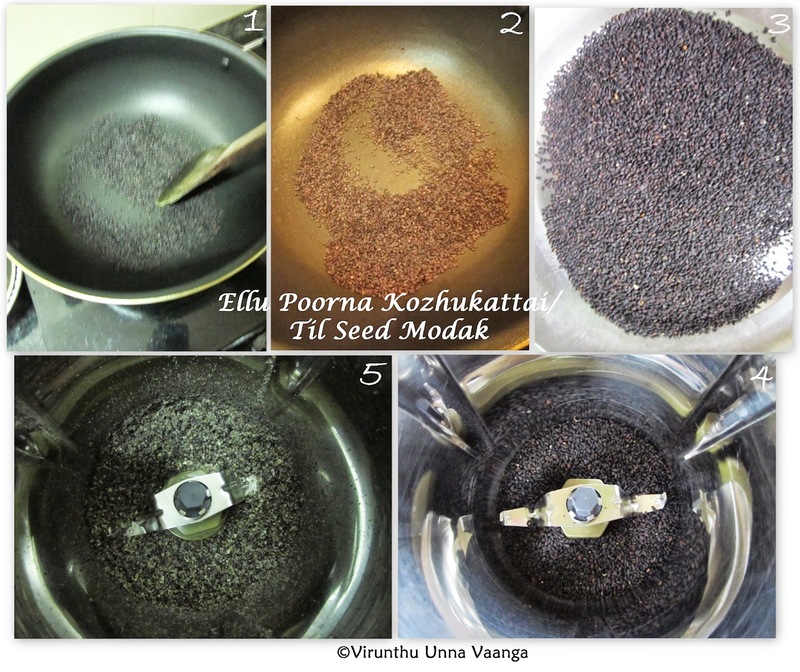 Rich Copper content in sesame provides relief for Rheumatoid Arthritis. 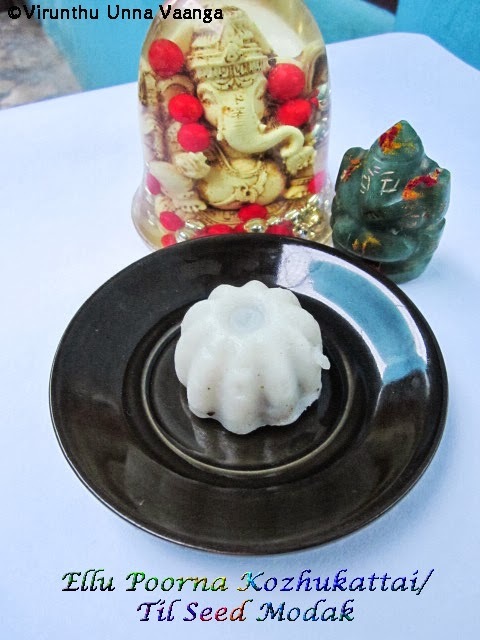 It has a no.of anti-inflammatory and antioxidant enzyme. Magnesium content in Sesame supports vascular and respiratory health. Contains good amount of Calcium and Zinc. Lower the cholesterol, high blood pressure. Dry roast the sesame seeds in a dry pan till the aroma comes and cool it completely and grind it to a coarse powder. 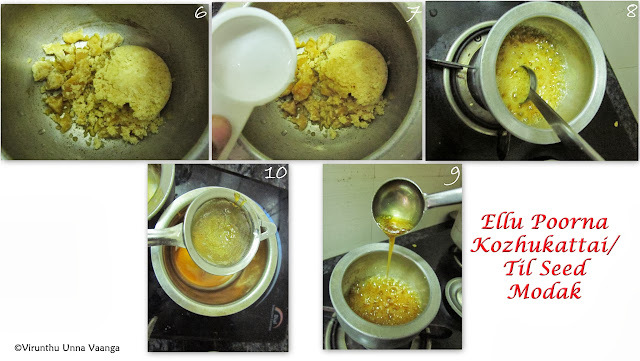 Powder the jaggery (1/3 Cup) if its in big size or break into small pieces add 1 Tbsp of water to it and melt it in a pan on low flame till it completely melts, then switch off the flame. Immediately, filter the syrup to another bowl using coffee filter or siever, then add grated coconut to it and again keep it in low flame, now it will starts boiling stir it continuously. When it comes like frothy add powdered sesame seeds and cardamom powder mix it well then switch off the flame when it starts rolling. Keep it in one bowl and filling is ready now. Boil 1 1/3 Cups of water with ¼ Tsp salt and 1 Tsp of oil, when it’s boiling well switch off the flame. 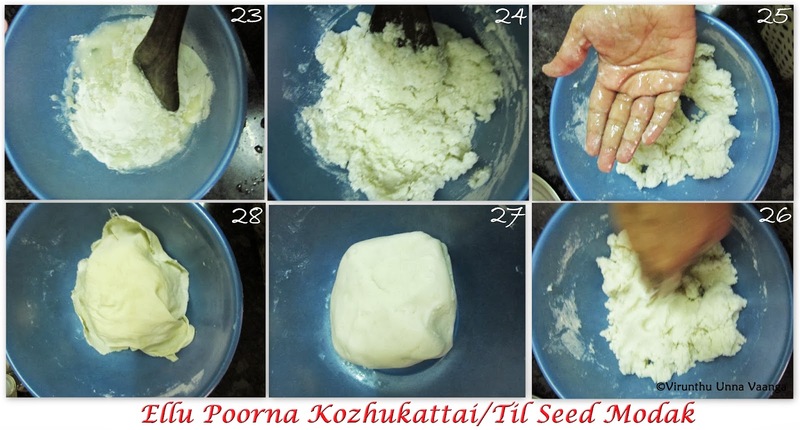 Add boiled water little by little to the rice flour and knead it using wooden ladle then just cover it with damp cloth for 5 minutes. Now it will be warm dough, and knead it well by oil greased hand. Pinch some dough and make it lemon size balls. 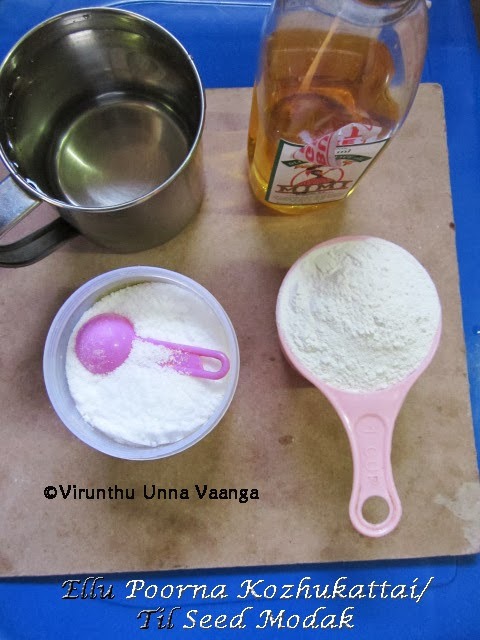 Grease your hands with oil, then tap the dough and make circle shape. Keep the filling at the centre, and then cover it as I shown in the picture, I have shown 2 methods. 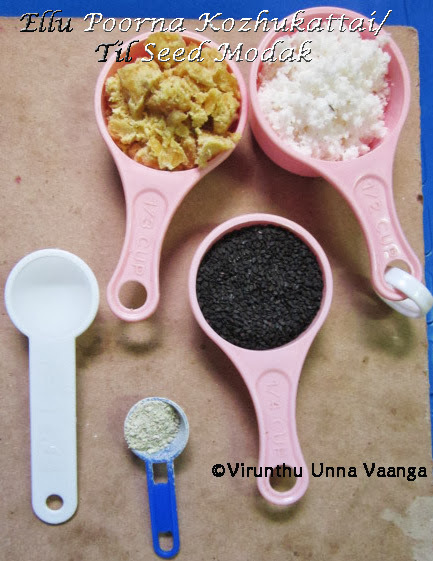 After shape it, place in the idli plate or steam plate and steam it for 7-10 minutes. It will look transparent after cooked. 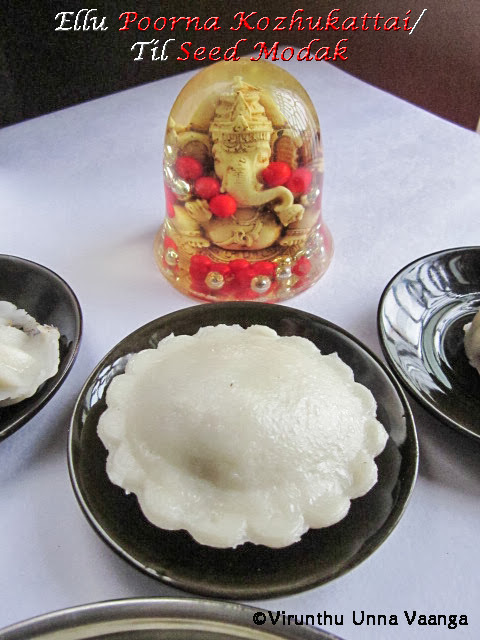 Use homemade rice flour or good brand rice flour. 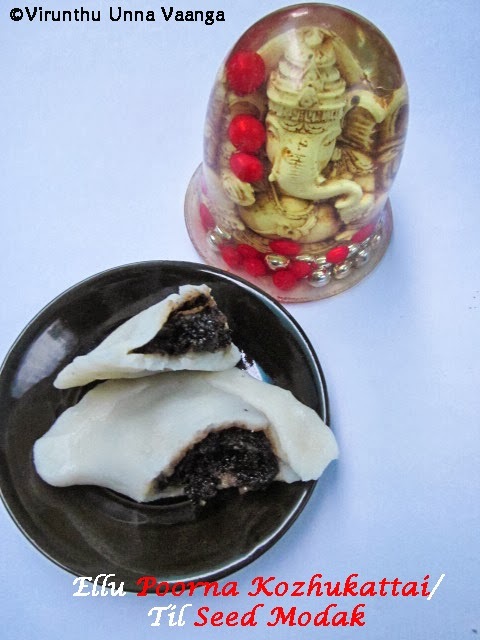 If you are getting black sesame seeds replace with white sesame seeds. 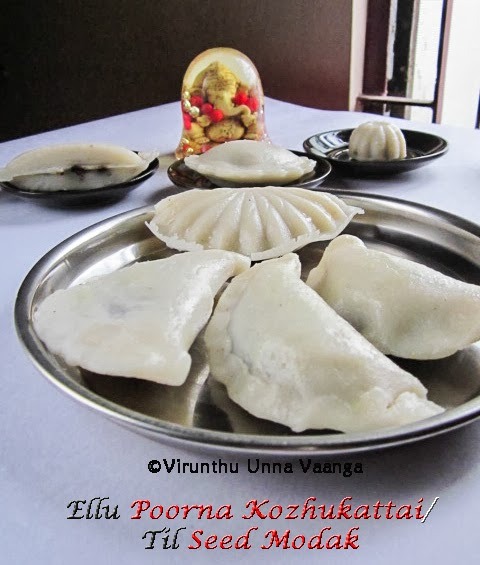 Hope friends you love the traditional and healthy Ellu (Til) Kozhukattai!!! All the best for you challenge and am sure u gonna rock it!!! THANK U SO MUCH DIVY FOR GIVING THE OPPORTUNITY TO HOST THE GREAT SNC!!! 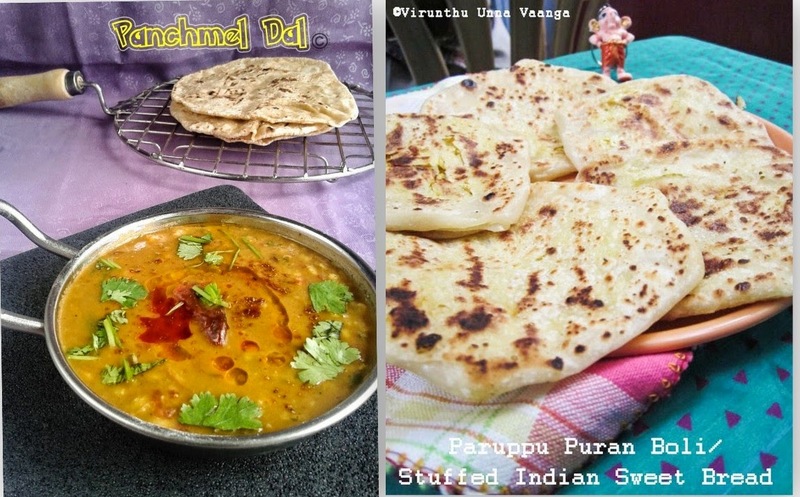 Lovely challenge viji. 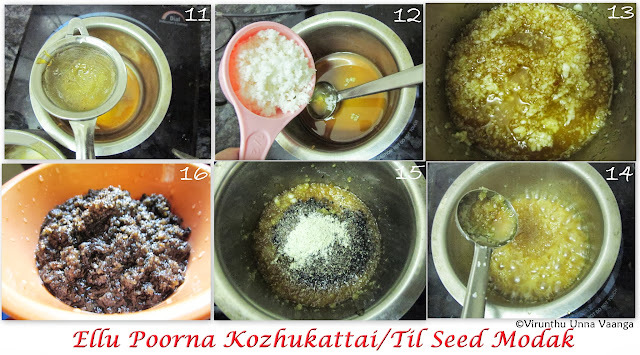 Very delicious kozhukattai. 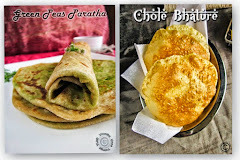 Nice...till one is new to me..ll try to make thm..can i use white till instead black? After 2months of cap i'm going to participate in SNG challenge again.. i'm so happy to make this kozhukattai.. thanks dear..
what u do for thos shapes ..